AIR CONDITIONING As part of the Aspen air conditioning service we provide a comprehensive and money saving preventative air conditioning maintenance contract. HEAT PUMPS ‘Air source heat pump’ could apply to all the split-type and VRV/VRF heat pump systems we install, as the phrase simply means the use of the outside air as a heat source. DESIGN & INSTALLATION Aspen provide all types of air conditioning units, systems and air source heat pump systems. SERVICING & REPAIRS As with all mechanical devices, it is important to service and maintain air conditioning and air source heat pump equipment to achieve good performance and reliability. The Aspen Group consists of companies provide design, installation, preventative maintenance and repair of air conditioning and heat pump systems for all types of commercial and residential applications, from small office air conditioning or bedroom to a large retail store or office block. In-house air conditioning design, installation and maintenance are also offered. From initial FREE site survey or customer brief, Aspen Air Conditioning will carry out a professional design and put forward competitively priced proposals. Aspen Air Conditioning’s own trained and experienced staff will carry out the installation quickly and efficiently with minimum disruption. 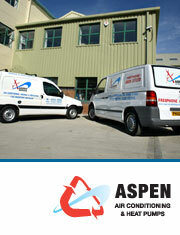 Aspen Air Conditioning are approved installers for all major equipment brands. For peace of mind Aspen Air Conditioning offer up to 5 years warranty on certain brands of equipment (subject to take up of an Air Conditioning Maintenance Contract). During the winter months, using smart and efficient heat pumps to heat your home can be a big money saver. Many of us turn on the central heating as soon as it starts cooling down and leave it on until the temperature rises in March/April. By using heat pumps or air conditioning heating systems you can quickly heat your home. The benefits of a heat pump are that it can supply more than 3kW of heat for every 1kW of electricity it consumes, is a space saving alternative to central heating as well as providing you with an efficient cooling system in the warmer months. Aspen can now provide air source heat pumps that allow you to heat your home or business premises much more efficiently than with traditional heating equipment. * I consent to having Aspen AC collect my details.